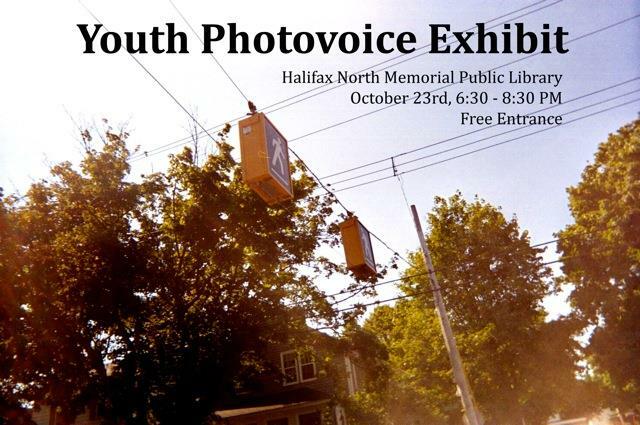 All were welcome last Thursday to browse a very important collection of photos at the North Memorial Public Library. This collection was the result of the dedication and hard work of youth from St George’s YouthNet and the Needham Community Centre. 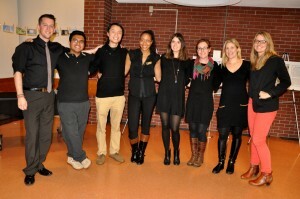 They came together to engage in a community based participatory action project, facilitated by a group of medical students at Dalhousie University. Although this team of 8 medical students reached out to initiate the project, George’s YouthNet and the Needham Community Centre were the key drivers and youth leaders were involved in each project session. We felt that the youth perspective is often unheard especially with regards to issues that affect them. Our role as facilitators was to ask the youth important questions about their lived experiences within the context of the community they reside. After engaging youth with some critical questions, we then asked the youth to take pictures of elements in their community that affected their lived experience. The youth then explained why they took certain photos and what some of the issues they were trying to convey through the photos were. At this time, youth also discussed how the photos meant different things to them and how their perspectives about issues affecting their community paralleled or differed. It was an opportunity for some of the participants to also share aspects of the history and events that occurred in their community, linking past municipal and provincial choices to their current situation. 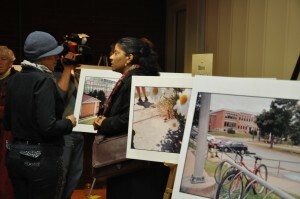 The goal of photoVoice is to promote action. It is hoped that the youths’ ideas and thoughtful work, once made available for the community to see in this way, will spark interesting discussion among community members about what actions the community would like to take based on some of the narratives and photographs from the youth. To learn more about PhotoVoice please visit their website. 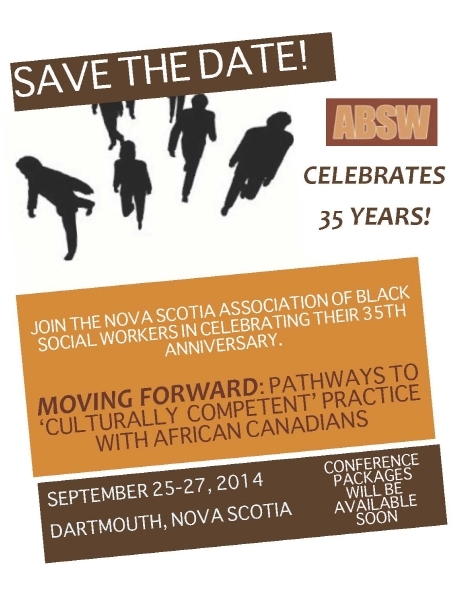 This conference was held in celebration of the 35th anniversary of the Association of Black Social Workers (ABSW), entitled “Moving Forward: Pathways to ‘Culturally Competent’ Practice with People of African Descent”. It ran from September 25th-27th, 2014. 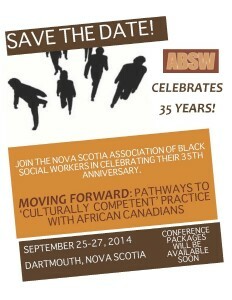 The ABSW is a volunteer charitable organization which consists of Black Social Workers, Human Service Workers, and other helping professionals throughtout the province of Nova Scotia. Their key mission is to act as a support group and professional development resource for African Canadian workers. It was important for me to participate so that I could interact with Social Workers already working in the field and gain a broader understanding of the spectrum of social work and all the needs/issues the profession addresses. I was also exposed to the challenges and barriers facing Black social workers, and other Black professionals. I will use this conference, and my volunteer work in youth crime prevention, to continue the battle for social justice, social change, and equality for everyone. 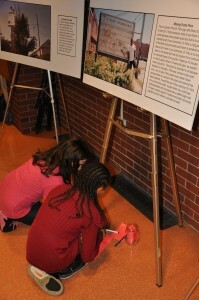 The attendees included social workers, educators, and some health care workers. I really enjoyed the workshop discussions such as racism, justice, spirituallity, health, family preservation, child welfare, mental health and addictions, and intimate partner violence. I was impressed with the level of expertise, experience, knowledge, and quality of the presentations and Q&A sessions. The presenters were all excellent speakers. I’ve learned that in some ways, people of African descent have made inroads in the battle against racism, discrimination, and inequality. However, much work still needs to be done to achieve an even playing field where skin color and cultural diversity are celebrated differences, not barriers used to oppress and separate people. I will use this conference, and my volunteer work in youth crime prevention, to continue the battle for social justice, social change, and equality for everyone. The conference has reaffirmed my perspective that social inequality, racism, discrimination, and oppression are alive in Nova Scotia. Previously, a Dalhousie nursing student from Africa in his late 20’s told me he had not experienced racism until he came to Nova Scotia about 3 years ago. One of the conference attendees from Maryland, USA, had told us she hadn’t been aware that Canada had a history of enslavement. I would highly recommend this, and similar conferences and experiences, to anyone and everyone interested in social justice, social change, cultural diversity training, and growing professionally and personally. I was able to network with people from different countries, backgrounds, experiences, education and cultures. Thank you for the opportunity to take part in this. 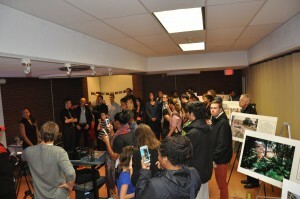 Now or Never: Innovation in Health Care, a series of new planned public forums in Halifax was off to a great start this past Tuesday, September 30th, 2014. The Spatz Theater at Citadel High School was buzzing with community members, health care professionals, students, and leaders waiting to hear Dr. Danielle Martin speak on issues of access and sustainability of the Canadian health care system. 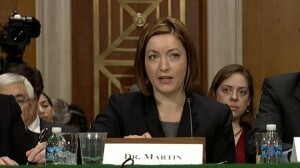 A family physician, academic, Vice President Medical Affairs and Health System Solutions at Women’s College Hospital in Toronto, and an avid supporter of the public health care system, Dr. Danielle Martin is well known for taking on a U.S. Senate committee and defending Canada’s health care system. The session also included the comments, thoughts and questions of panelists, including: Laura Fraser, staff reporter, The Chronicle Herald; Dr. Kathleen MacMillan, director, school of nursing, Dalhousie University; Dr. John Sullivan, QEII cardiovascular surgeon, president, Doctors NS; Gerry Post, patient / community activist. 1) 20 Drugs to save a nation: A national drug program to fund 20 prescription drugs not available through Medicare. 2) Doing more with less: Innovations, such as applying queuing theory to health care, to address system issues and improve access. 3) Basic income: Toping up income for individuals below a certain income threshold in order to start addressing the fundamental social determinants of health. Dr. Danielle Martin also presented to students, trainees and fellows during a luncheon the following day. Through a physician’s lens, she spoke of the need for health care professional leadership in addressing system issues and bridging the gap between health care professionals and administration. Her candid, thought provoking sessions, stimulated discussion and will encourage progressive conversation. Each session was followed by questions and comments, only supporting Dr. Danielle’s views that Canadians look to their health care system as a source of pride, but also recognize that there is room for much improvement. With a beginning like this, there is much to anticipate from this new series of public forums! More information on this session can be found in the Chronicle Herald story; Health care fixes focus of meeting.